1.97 billion donuts, and counting. 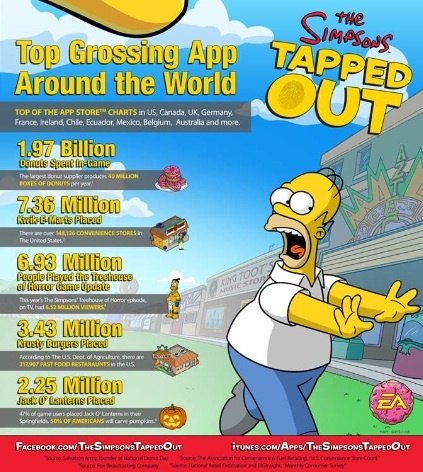 We knew The Simpsons: Tapped Out was popular, but a recent number crunch put everything in perspective. How big is Electronic Arts' freemium effort? Check this out. Top Grossing App Around the World: Top of the charts in U.S., Canada, UK, Germany, France, Ireland, Chile, Ecuador, Mexico, Belgium, Australia and more. 1.97 billion donuts spent in-game: The largest donut supplier produces 40 million boxes of donuts per year. 7.36 million Kwik-E-Marts Placed: There are over 148,126 convenience stores in the United States. 6.93 million people played the Treehouse of Horror game update: This year's The Simpsons' Treehouse of Horror episode on TV had 6.52 million viewers. 3.43 million Krusty Burgers placed: According to the U.S. Dept. of Agriculture, there are 217,907 fast food restaurants in the U.S.
2.25 million Jack O' Lanterns placed: 47 percent of game users placed Jack O' Lanterns in their Springfields. Fifty percent of Americans will carve pumpkins.